How did ‘Local Food’ come about? The idea came about because work around food is such a popular focus point for Transition groups, and there is a real need for a book that shows what other amazing projects are out there and that can inspire more of the same. At the same time, food is a powerful entry point into the broader aims of community transition and the current growing popularity in food awareness is a good opportunity to spread an understanding of transition and bottom-up, cultural transformation. In the book we look at why change in food culture needs to happen, then dedicating most of the chapters to what is already happening – the people and the stories behind various types of local food project, and their tips for others embarking on similar projects. This is followed by general suggestions for setting up a local food project, and a comprehensive list of resources (funding bodies, sources of info and support, relevant projects etc). I think it’s important to emphasise that we’re not presenting a blue print for food change, or a one-size-fits-all approach. That would only help to stifle the creativity bubbling away in communities across the world. Instead, we show what is already happening, offer suggestions and tips that may be of help to fledgling food initiatives, and encourage them to embark on work that is appropriate for their energy levels, place, community, and environment. 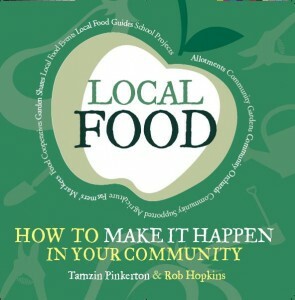 There will undoubtedly be many more ‘types’ of local food projects that will spring up in coming years – this book is a snapshot of the here and now, and may well need to be revised every 6 months! How did you research the book, and how did you elicit input from Transition groups? Starting in September ’08, I got in touch with all of the official Transition Initiatives around the world at the time, and sent out questionnaires to their food groups and contacts. In the questionnaires I asked them to tell me about the local food projects they were participating in, where the idea came from, how many people are involved, what positive or challenging outcomes that emerged, and much more. I followed responses up with phone interviews, or, where possible, interviews done face to face. I also put a shout out for local food project stories on the Transition Culture website and on the Transition forum, and a number of people got in touch with me and shared their stories with me this way. Choosing which ones to explore was partly about getting an even spread of featured projects, from the small to the large, the simple to the complex etc. But it was also about presenting projects in the book that could be of interest or learning for readers. 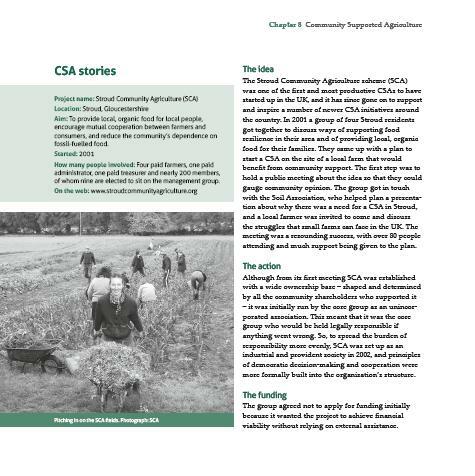 Throughout this process we became increasingly aware of the importance of celebrating the vast amount of local food work that is also being carried out beyond the Transition Movement, and that the Movement has built on and is drawing from. 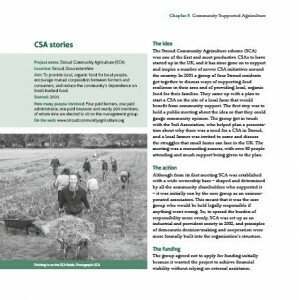 So I began to look further afield for some well-established local food projects to balance out the list of relatively new projects we already had, and to make the point that collaboration, inspiration and learning between local food initiatives is crucial, whether they were initiated within the Transition Movement, by organisations in the field, or as a result of spontaneous, independent community action. We also decided to ask a number of people working with local food to contribute short articles about an area of their interest, so we have, for example, Hugh Fearnley-Whittingstall writing a piece about garden shares, Fergus Drennan on wild food, and Sandor Katz on fermentation, amongst many others. What are your hopes for the book when it is published? My hope is that people who are not yet participating in local food networks will read this book and feel that they are capable of playing a part in the local food revival, know that they can shape the systems and chains that feed us, and see that food culture change is not only necessary, but also possible and wonderfully good fun. For people already involved in Transition and local food, I hope the book will feed their enthusiasm, generate more ideas and provide them with many resources, contacts, tips and stories to help them on their way. This is your first book.. what does it feel like now that your book is nearing completion? It has been a real privilege to be able to watch and nurture this idea to fruition, and to see it in the paper flesh will be very exciting. Exploring the abundance of local food projects that are proactively contributing to a healthier present and future has been awe inspiring. I now feel confident that, through creativity and passion, we can reclaim our food systems and find a balance between human and environmental health – not just because we have to, but because we want to. Tamzin will be speaking with myself and Shaun Chamberlin at the ‘Transition Morning’ at Ways With Words Literary Festival at Dartington on Monday 13th July at the Barn Cinema, Dartington, Devon, 9.30 – 12.30 in the morning. 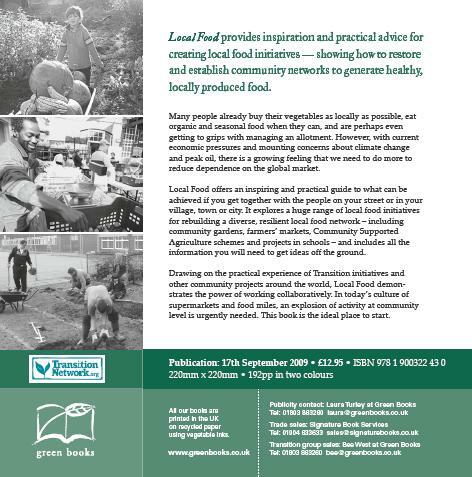 You will be able to pre-order ‘Local Food’ here at Transition Culture from the beginning of September. Congrats Tamzin/Rob – looking forward to getting a copy! Struggling to open the ‘blad’. Just me?? I thought BLAD was an acronym for Tamzin – Brilliant, lovely, adorable, darling! I love the bit which honours the work done outside the transition groups – it’s so important to keep in mind the richness of actions all over the place that are rebuilding resilience and happiness, regardless of their origin. Nice one Tamzin – I’m very much looking forward to having a good read of the book. I had no problem loading the BLAD. Looking forward to the book – will order from my local book shop this weekend. where can if find details of this ?